Want to avoid a routine project build that’s the next best thing to liquid nitrogen? Then splash out. Prices for the Boreas MTEC chassis do vary depending on how many CPU and GPU heatsinks you want - they start at around £550. Essentially, this is water-cooling for the lazy. In the box is a Silverstone Temjin chassis with CoolIT's most powerful TEC cooler installed and all piping ready filled and completely sealed. Attaching the cooling blocks to CPUs is relatively straightforward, while connecting to graphics cards is just a little trickier. It's a tad disappointing that there's no power supply included in the astronomical price, mind, but the theory is clearly that if you're designing this kind of system, you'll probably want to choose your own PSU anyway. 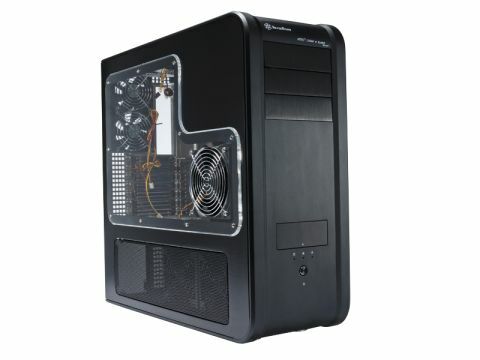 The case itself is excellent - a very roomy design and with plenty of fans. Placing the hard drive mounts in a closed, individually cooled compartment at the bottom of the case is particularly innovative. The TEC unit sits where you'd normally expect drives to be, and plugs into a control unit which itself can be mounted anywhere inside the case. It's a little disappointing that the control unit is a fairly dumb affair, and all cooling must be controlled via a driver interface. Having no manual controls on the physical unit means sacrificing a USB header for wiring it up. Worse, when we booted into Windows, something confused the sensors which decided to send cooling into overdrive. Instead of heading for a target of 25°C, the Boreas unit almost managed to send a QX6850 CPU under load into the single digit temperature range. Needless to say, that's some impressive cooling. With the driver problem sorted out things were certainly a lot quieter - as quiet as six case fans and two blowers on the TEC unit can be expected to be - and the Boreas almost won our hearts. Almost, because for some reason northbridge coolers don't come as standard with the unit, and to make the most of the enormous overclocking potential here, they will be mandatory. Despite that, what we have here is a straight-out-of-the-box kit that will give your processor and graphics card the mother of all ice cream headaches. It's not perfect, it doesn't come with a PSU and it's pricy - but damn is it frosty.